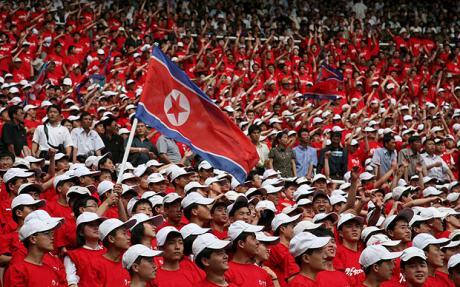 The heirs of Chollima and the long and complicated path to the 2010 World Cup. In 1966, after a qualification marked by controversy, withdrawals and political intrigue, North Korea arrived to play in the World Cup as unknown players from a land that few knew very much of. Typical of the British culture, ever keen to support the underdog though, the fans took to the ‘Chollima’ squad with their small stature and naïve innocence. It was an approach that saw them vanquish Italy in one of the most sensational results in World Cup history and then lead Portugal by three goals to nil, before being swamped by the brilliance of Eusebio. The football observing public were charmed by these apparent innocents abroad. A brief dip into the fairy-tale of make believe that, as always seems to be the case, eventually fell short. The North Koreans left for home, leaving behind them nothing but fond memories of a team small in stature, but big in heart. When they returned home however, the welcome was hardly that fit for the type of heroes that the players were perceived as being back in England, and especially in the north-east where the squad was based. Like so many Eastern European regimes of the Cold War era, sport only has a purpose if it furthers the aspirations and stature of the state, and despite the massively above par achievements of Pak Doo-Ik and his compatriots, they were treated as failures back in the so-called Hermit Kingdom and punished as such. Their major failing, apparently, was letting slip a three-goal lead against Portugal when, surely, they should have been lauded for having the audacity for such an extravagant achievement. It would be another 44 years before the country would again send a team to compete in the planet’s most celebrated football jamboree. By then memories of such things may have been dimmed by the passing of time. They shouldn’t have been though. For North Korea, the qualification competition for the 2010 World Cup, was every bit as complicated a process as had been the case back in the sixties, with the cold hand of politics inevitably having a heavy influence, and eventually a late helping hand from a Manchester United player easing their path. Competing in the Asian Football Confederation qualifying process, comfortable home and away victories over Mongolia gave them a 9-2 aggregate score and progress into the second round, where groups were assigned. With South Korea amongst the seeded teams in Pot One, and their northern neighbours in Pot Two, it was to no-one’s great surprise when they were drawn together in Group Three. They were accompanied by Jordan and Turkmenistan. The series of games opened on 6th February 2008, when South Korea crushed the Turkmens 4-0 in Seoul’s World Cup Stadium, with goals from Kwak Tae-Hwi, Manchester United’s Park Ji-Sung and a brace from Seol Ki-Hyeon. On the same day, North Korea visited the Amman International Stadium in Jordan, and a goal just before half-time by Hong Yong-Jo gave them a victory. The next game for both teams would be crucial. On 26th March 2008, North Korea were scheduled to entertain their southern brethren. It was a match full of potential political problems and, sure enough, well before the game was due to take place that potential was realised. The authorities in the north refused to allow either the flying of the South Korean flag, or the singing of the south Korean anthem on their territory. For a while it looked like the games may have to be cancelled, calling the whole qualifying process into question. Eventually, a compromise was reached, with the game being switched to Shanghai in China. In an atmosphere that could aptly be described as ‘tense’ a goalless draw was played out that was neither diplomatic or overly advantageous to either teams’ aspirations. It was important therefore that the next game was won. On 31st May, South Korea entertained Jordan and thanks to a Park Ji-Sung strike just ahead of half-time and a penalty from Park Chu-Young three minutes after the restart, everything looked to be heading in the right direction for the home team. Two late goals from Abdel Fattah however saw a couple of points slip through South Korean fingers, and Jordan escaped with a draw. A few days later, North Korea visited the Ashgabat Olympic Stadium in Turkmenistan and achieved a draw. Although on the surface, it sounds like a reasonable result, it would be the only point the Turkmens achieved in the group. As such, it was probably as bad a result as South Korea letting points slip when two goals clear at home. Five days later, the return fixtures were played. South Korea won in Jordan and North Korea won in Pyongyang. The group was now looking all but settled, and when, seven days later, a brace from Hong Yong-Jo helped North Korea to a 2-0 victory over Jordan in Pyongyang and a hat-trick from Kim Do-Heon took South Korea to a 1-3 victory in Ashgabat, the only issue left to be resolved was which of the Korean teams would top the group. With the last game to be played out in Seoul, South Korea were probably favourites. A 0-0 draw saw them win the group on goal difference. The Asian Football Confederation would surely have been relieved that so potentially explosive games had been completed successfully after all – and without too much drama. They would though surely have been aghast in equal measure when the two Koreas were again paired in the next groupings. The federation had been awarded four qualifying places, and one play-off spot. With ten teams now into the final round, two groups of five teams were selected with the top two in each group qualifying and the best third place team going forward to a play-off. Alongside the two Korean teams, Saudi Arabia, Iran and United Arab Emirates would contest Group B. It would be an altogether more competitive group than they had experienced in the earlier round. The competition got underway on 6th September 2008, when North Korea visited Abu Dhabi to play the UAE. With just over 15 minutes to play, the game remained goalless, but then goals from Choe Kum-Chol and An Chol-Hyok took the Koreans two clear, before a late goal from Saeed cut the arrears, but to no great avail. South Korea entered the competition four days later with what should have been an away fixture in Pyongyang. With the Communist authorities maintaining their stance on flags and anthems though, the game was again moved to Shanghai and a 1-1 draw resulted after Hong Yong-Jo gave the non-hosting hosts the lead with a penalty just past the hour mark, and Ki Sung-Yueng equalised five minutes later. In the middle of October, South Korea demolished the UAE 4-1 at home, and North Korea were brought up short by a 2-1 defeat in Tehran when a goal from Jong Tae-Se wasn’t enough to wipe out the home side’s lead given to them by Mahdavikia and Nekounam. The advantage now lay below the 38th parallel. Before the turn of the year, South Korea underscored their advantage by winning 0-2 away to Saudi Arabia at the King Fahd International Stadium in Riyadh, thanks to late goals from Lee Keun-Ho and Park Chu-Young. All of which meant that, at the turn of the year, South Korea had accumulated seven points from three games and North Korea had four from the same number of games. South Korea also had their home game against their northern neighbours to come. This group wouldn’t be a two-horse race though. Whilst the UAE had just a single point from four games played, and wouldn’t get another from their remaining fixtures, both Saudi Arabia and Iran would consider themselves to be well in the race. As with North Korea, Saudi Arabia had four points from three games and Iran were looking serious contenders with five points from three games. Qualification emerged from its winter hibernation on 11th February with North Korea defeating Saudi Arabia in Pyongyang by a single goal. South Korea had a much tougher game though. Travelling to Tehran to face Iran, they were trailing 1-0 inside the final ten minutes when Park Ji-Sung came to the rescue with a later equaliser. It was a blow that the Iranians never recovered from. The following month, they lost at home to Saudi Arabia, again after being a goal to the good. At the same time, North Korea underscored their recent form with a 2-0 home victory over the UAE. The Saudi victory put them back in contention for qualification though with their next game being against the makeweights of the UAE whilst the two Korean teams faced each other in Seoul. It was always fated to be a dramatic match, and inside the first six seconds, a shot by North Korean captain, Hong Yong Jo brought a diving save from home ‘keeper Lee Woon Jae, who deflected the ball around his right-hand post for a corner. For the rest of the first-half though, the home side dominated and although Ri Myong Guk, in goal for the visitors wasn’t extended too often, the defence in front of him was necessarily busy, keeping a stream of attacks at arm’s length. At the break however, the game remained goalless. The second period was less than three minutes old when a major controversy occurred. A cross came in from the visitors’ right flank. Leading the line for the North Koreans, Jong Tae Se powered in a header that arrowed towards the bottom right-hand corner of Lee Woon Jae’s goal. The veteran stopper, known as ‘Spider Hands’ in Korea, and just 25 days short of his 36th birthday, hurled himself to his right as the ball bounced just before the line. Reaching back, he pulled the ball back into play, but had it already crossed the line? Replays suggest that Spider Hands’ efforts were too late, but he escaped any web of intrigue as the referee from Oman, Abdullah Al Hilali, without the support of any goal-line technology and well behind the play, awarded nothing and the game continued. It was perhaps strange that there was very little protest from the North Koreans, but if the game went against them in the final analysis, there was certainly something for the authorities to point at and call ‘foul’ on. From then on though, the game mainly took on the pattern of the first half, with South Korea pressing and the visitors offering only sporadic threats. Pressure mounted, but even when spaces were created, shots were either wide of the target or straight into the grateful arms of Ri Myong Guk. Then, on 86 minutes, with the pressure now almost incessant and the visitors hanging on for a point, out on the right flank of the home attack, Mun In Guk hung out a tired leg and brought down KI Sungyueng. Kim Chi-Woo clipped the ball left-footed into the crowded goalmouth and in a confusion of jumping heads, stretching for a contact, the ball eluded the goalkeeper and ended up in the net. Replays suggested that the faintest of touches from the arm of North Korean skipper Hong Yong Jo may have slightly altered the flight of the ball. Doubtless though, it’s not something he would claim with any vigour. It was the decisive moment of the game, and after three draws across the couple of groups, a game between the two Koreas had finally produced a positive result. As suspected though, the regime across the border was not prepared to accept defeat graciously. Complaining that their players had been intentionally given food poisoning to stop them performing at their best, they strangely ignored the perhaps more legitimate case of the header that had arguably crossed the line. The result put South Korea in the box seat for qualification. With an away game to come against the UAE and then home fixtures against Iran and Saudi Arabia, they seemed to be in the home straight. For the North however, things were now very different. They had two games remaining, home to Iran and then away in the final round of fixtures to Saudi Arabia. On the same night that North Korea were going down in Seoul, the Saudi’s had defeated the UAE 3-2 in Riyadh, after having to come back from surprisingly being 1-2 down. On 6th June, North Korea played out a goalless draw at home to Iran, and South Korea travelled to the UAE, returning with a 0-2 victory. The Iranians’ defeat was a big stumbling block for them and they were now in difficulty if they were to gain an automatic place, or even to finish in third place with a good enough record to get into the play-off. With two rounds of fixtures to play, South Korea had fourteen points with two to play, North Korea had eleven with one to play, Saudi Arabia had ten with two to play and Iran now appeared to be the outsiders with seven and two to play. Four days later, South Korea did themselves and North Korea a big favour by playing out a goalless draw at home to Saudi Arabia, and Iran just about kept themselves in contention with a 1-0 victory at home to the UAE. It all meant that so long as South Korea avoided defeat at home to Iran, in their final game, they would top the group regardless of results elsewhere. For North Korea, the equation was somewhat more complicated. A victory when they visited Riyadh to play Saudi Arabia would put them into second place and qualification. If they only drew however, they would need South Korea to avoid losing at home to Iran to prevent the Iranians leapfrogging them into second place. On the evening of 17th June, with just eight minutes remaining in Seoul, the North Korean regime would have been polishing up their rhetoric and political angst, with the Iranians a goal to the good against South Korea, thanks to a piece of opportunism from Masoud Shojaei, who dived in ahead of defenders and goalkeeper to divert a cross home. It looked like North Koreas could be in trouble, but Park Ji-sung exchanged a wall-pass, drove into the box and fired low inside the near post to bring things level. The game ended all square, eliminating Iran from the automatic qualification calculation. North Korea then managed to play out a goalless draw against the Saudis to take the runners-up spot on goal difference. Qualification had been a tortuous path for North Korea but, for the first time since 1966, they had a seat at world football’s top table. Their experience at the tournament itself would be almost as dramatic. In their first game, they succumbed to Brazil as expected, but by the entirely respectable score of 2-1. The result prompted the North Korean regime to screen the second fixture, against Portugal live. It was an extraordinarily brave decision, and dropped the erstwhile sanitised television output into the arms of the fates. Perhaps they had been convinced by their own rhetoric though. A 7-0 trouncing was their reward and, unsurprisingly, the experiment wasn’t repeated for the final game; a 3-0 defeat to Cote d’Ivoire. The fate of the official that recommended the screening of the game against Portugal is unknown, but probably safe to say that promotion wasn’t it. For the players and officials that travelled to South Africa, their fate was cast. If the Chollima team of ’66 had been castigated despite their heroic efforts, hope for anything different would surely have been folly. Perhaps understandably with the dangers of the homecoming in mind, the approach of the North Korean team in the tournament was a pale shadow of the innocence and joy of 1966. In its stead was a dour and defensive outlook, seeking to contain, much as they had done in qualifying, when in the final group of eight games, they scored only seven times, just one more than the UAE who finished bottom of the group with a single point. The opposition in the tournament proper was a big step up though, and such tactics were sure to founder. The fear of the reaction at home, ironically, almost guaranteed it. Sure enough, the players and officials were compelled to endure a six-hour public haranguing, at the Working People’s Culture Palace in Pyongyang, where they were accused of letting down the country, and most importantly betraying their ‘dear leader.’ They were also subjected to ideological criticism and forced to condemn the coaches whose tactics and team selection had led to the defeats. The whole session was completed in front of an audience of some 400 athletes and sports students. Perhaps it was a less than subtle case of pour encourager les autres. It may not be a surprise to hear that North Korea’s footballers failed to qualify for the 2014 World Cup in Brazil, and are already eliminated from contention for the 2018 edition in Russia, after finishing second to Uzbekistan in the second stage and failing to qualify for the next round. Given the history of 1966 and 2010, it’s not difficult to assume that there may well be a number of footballers in North Korea who don’t look on that as a particularly bad thing.